Salsa Criolla has two of my favorite words: salsa and criolla. Salsa of course can refer to the music and dance from the Caribbean, but here it refers to the sauce or spice that adds a special touch to any dish. And criolla or creole refers to the influence of Afro-Peruvian culture in Peruvian cuisine. 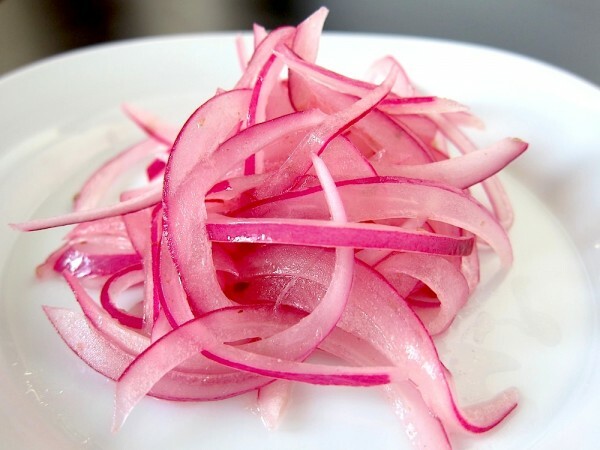 Not surprisingly, you may be familiar with pickled onions from many other creole cultures, such as from New Orleans, but this recipe is the version I grew up with. Simple, flavorful, and colorful, it’s a perfect garnish on many dishes. But be warned, one bite and you just may find yourself dancing and speaking Spanish. In addition to the ingredients above, you’ll need a bowl to wash the onions and a cup to mix the pickling sauce. Julienne the red onion, place in a bowl, and wash with running water. Drain the water and set aside. In a cup, mix the vinegar, olive oil, juice of 1/2 a lime, and spices. Pour the pickling sauce over the onion and toss in the bowl. Cover and refrigerate for an hour before serving. Onions can vary quite a bit in size, and the measurements here are for approximate 1 cup of loosely packed julienned onions. The pickling sauce will turn the onion a bright color and infuse it with flavor. To make sure all the onions are pickled, toss once or twice after putting the bowl in the fridge. Sometimes I make the pickled onions a day in advance and keep them refrigerated before serving.